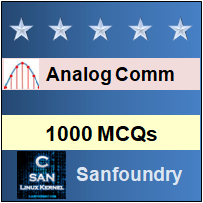 This set of Analog Communications Multiple Choice Questions & Answers (MCQs) focuses on “Single Side Band Transmission”. 1. What do you understand by the term SSB? Explanation: SSB stands for Single Side band. In SSB-SC (Single Side Band Suppressed Carrier), the carrier is suppressed and only either of the two sidebands is transmitted. This reduces the power consumption and also lessens the bandwidth. 2. SSB is a standard form for radio communication. Explanation: SSB stands for Single Side band. In SSB-SC (Single Side Band Suppressed Carrier), the carrier is suppressed and only either of the two sidebands is transmitted. Single Side Band can also be seen as a standard form for radio communication. In Single Side Band, carrier wave is suppressed by about 50dB. 3. Ribbon microphone has a bidirectional feature. Explanation: It is correct statement that a ribbon microphone has bidirectional feature. Other microphones such as carbon, condenser etc does not have a bidirectional feature. 4. Antenna can only be used as a transmitter. Explanation: All antennas can be used as transmitter and receiver both. Antenna transmits or receives electromagnetic waves only. Transmitter antenna modulates the message signals and transmits the modulated waves and Receiver antenna receives the modulated wave and demodulates it. 5. TM is a pseudo analog modulation. Explanation: TM stands for Transpositional Modulation. In TM, the message signal is modulated by inserting inflections in the original waveform. The waveform is modified resulting in a modulated. TM is a pseudo analog modulation. In TM carrier also carries a phase variable. 6. What is the full form of PPM? Explanation: PPM is used for both analog and digital signals. In PPM, when a single pulse is transmitted in the allotted time shift, the message bits get encoded. It is mostly used for optical communication such as optic fiber. 7. CVSDM stands for continuously variable slope delta modulation. Explanation: CVSDM stands for continuously variable slope delta modulation. It can also be seen as delta modulation having variable step size. Delta modulation involves analog to digital conversion and vice-versa for the transmission of voice signals. Explanation: If the targeting area is changing continuously then it is better to use monopulse scanning system for accurate tracking as it avoids the problems in conical scanning systems, which often arise due to rapid change in signal strength. Explanation: In NBFM, the modulation index is less than or close to unity. It is similar to Amplitude modulation except a 180 degree phase shift at the lower sideband. 10. NBFM stands for Narrow Band Frequency Modulation. Explanation: It is a correct statement that NBFM stands for Narrow Band Frequency Modulation. In NBFM, the modulation index is less than or close to unity. It is similar to Amplitude modulation except a 180 degree phase shift at the lower sideband.